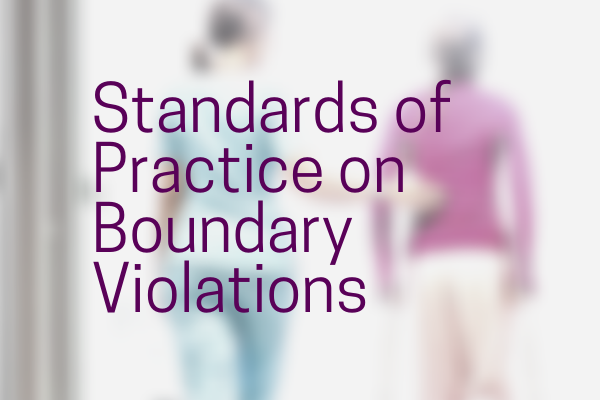 The College of Licensed Practical Nurses of Alberta (CLPNA) released new Standards of Practice specific to Bill 21 to address protecting patients from sexual abuse and sexual misconduct as well as other types of boundary violations. Standards of Practice are part of the overall legislative framework that governs the LPN profession in Alberta and provide the minimum standard of behaviour that LPNs are expected to meet in their nursing practice. Performance below the standard could result in disciplinary action. Prohibited Sexual Conduct: A finding of sexual abuse will result in permanent cancellation of the LPN’s registration and practice permit. A finding of sexual misconduct will result in a minimum of suspension of the LPN’s practice permit. The LPN-Patient Relationship: Under the definition of a patient, an individual will continue to be the LPN’s patient for a minimum of one year from the last day nursing services were provided, however in some circumstances there are exceptions to this time frame which extend the LPN-Patient relationship indefinitely. Sexual Relations with Former Patients and/or Individuals Closely Associated with the Patient: LPNs must always consider the appropriateness of ever entering into a sexual relationship regardless of how much time has passed. Mandatory Reporting Requirements: An LPN must report the conduct of other health professionals if there are reasonable grounds to believe that the conduct constitutes sexual abuse or sexual misconduct whether this occurs in or outside of the work setting. Additionally, the CLPNA will establish a Patient Relations Program to educate LPNs on preventing and addressing sexual abuse and sexual misconduct towards patients. Questions? Contact the CLPNA’s Practice Department at Ask CLPNA, practice@clpna.com, 780-484-8886 or 1-800-661-5877 (toll free in Alberta).